scholarly research; including contemporary references from newspapers, furniture pattern books and catalogues as well as relevant secondary source material - to give a practical framework for the accurate dating and critical assessment of Australian-made furniture. 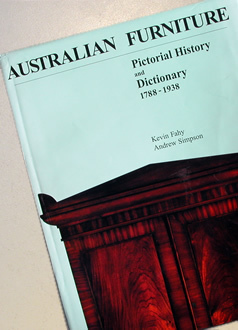 The dictionary entries in Australian Furniture: Pictorial History and Dictionary 1788-1938 contain over 420 black & white photographs of marks, trade cards and labels as well as collection and bibliographical references. Easy access to such previously unavailable information about antipodean cabinet and picture frame makers will undoubtedly influence the market for Australian furniture and may suggest new directions for collecting in both the public and private spheres. Dictionary 1788-1938 is planned as a fully self-contained work of reference.